The HSE Hot Oil Coat Conditioner mixed as a grooming spray in a spray bottle is my absolute FAVOURITE way to use this product. I know many others love to use it this way too however my biggest gripe has always been trying to find fabulous spray bottles. So I’ve hunted high and low to find the Super Sprayer for you. This trigger of the Super Sprayer is sturdier and stronger than any other trigger spray I’ve ever used. It dispenses nearly 3 times as much product as a regular trigger spray meaning that you get the job done faster and easier than ever before! To make a grooming spray with HSE Hot Oil Coat Conditioner add 100ml of Hot Oil (or your preferred amount, there’s no right or wrong with it! ), top up the bottle with water, mix & spray! The ORIGINAL highly concentrated, PREMIUM formula. Loaded with the highest quality Natural Oils and Vitamins for the ultimate conditioning treatment for your horse. Used and reccommended by many showing professionals, HSE Hot Oil is the ultimate coat oil to keep skin and coat hair in silky, gleaming condition. Coconut, Almond, Jojoba & Sunflower penetrate both the hair and skin to nourish and promote growth, Vitamin E & A with their anti-oxidant properties, feed the skin and protect from damage. Perfect for use after clipping to restore the depth of colour to the coat and replentish the horses natural coat oil balance. 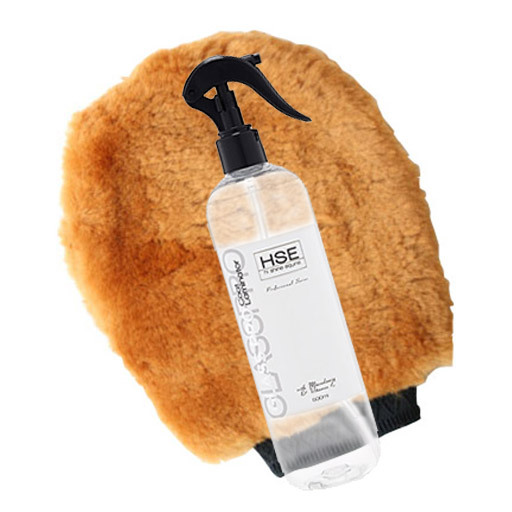 Used daily, HSE Hot Oil produces not only a brilliant shine, but makes grooming easier with less dirt filtering down through the hair to the skin. 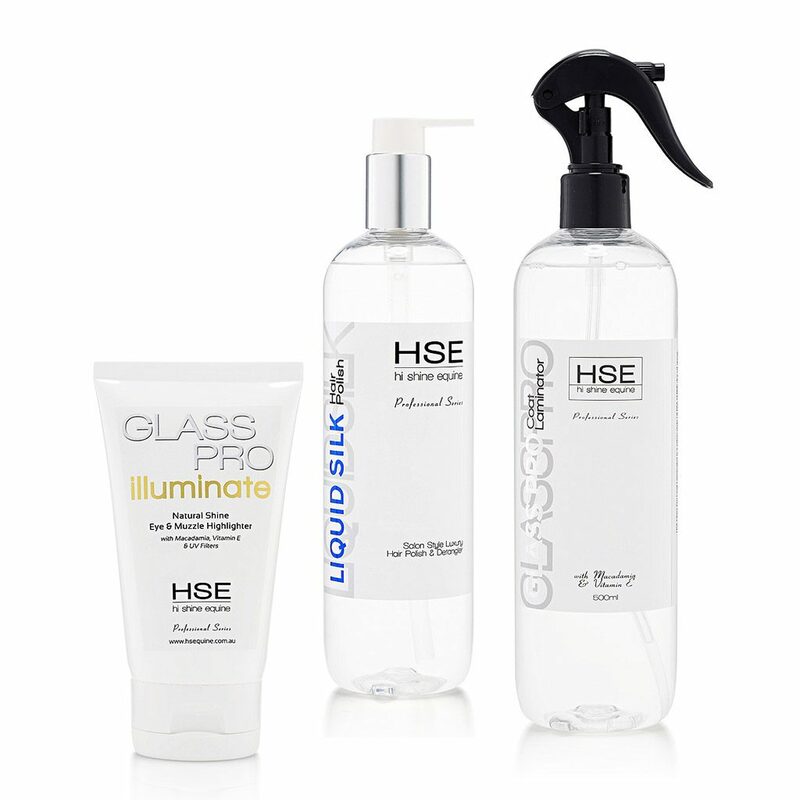 With one single treatment, HSE Hot Oil eliminates dry sunburnt coats and calms flakey itchy skin. Photographers also love this product… so easy to use for quick makeovers, turning hairy unkempt coats/manes/tails into smooth gleaming hair in minutes! 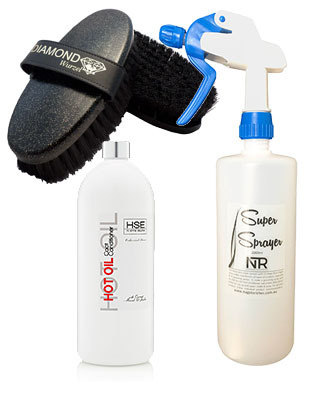 The Haas Diamond Rice Root Brush is a is a high quality synthetic Rice Root bristle brush. It’s dense robust bristles removes even stubborn dirt with ease. • Faster to dry than natural rice root bristles because they are not porous. They won’t absorb the dirt or bacteria either. AND the brush backs are made of a high quality synthetic material. Not only does this make them hygienically unbeatable, the possibility of splitting does not exist either. It really is an elegant looking horse brush in black with inlaid glitter particles in the back of the brush and a leather wrist strap.